The goal is to obtain chronometric ages from archaeological and palaeontological sites. Although recent progress has been made in understanding the phasing of wet and arid periods in the Arabian Peninsula, ages are not generally available for Palaeolithic sites or palaeontological localities. To gather data for the Early-Middle Pleistocene, the project will use geochronological dating techniques such as thermally-transferred optically stimulated luminescence (TT-OSL) and K-Ar dating methods. Those methods will be used to date sediments at the palaeontological sites in the Nefud desert in the northern part of the Arabian Peninsula, at the archaeological sections at the sites along the hill slopes near the modern town of Dawadmi in the centre of the Peninsula, and at the Wadi Fatimah river channel near the Red Sea. For the Later Middle Pleistocene to Holocene periods, sedimentary deposits from the Jubbah and Mundafan palaeolakes, the Nefud faunal localities, and the Wadi al-Batin / Wadi as Sahba river basin survey will be dated through a combination of techniques, including TT-OSL and Uranium series dating on springs and travertine deposits. 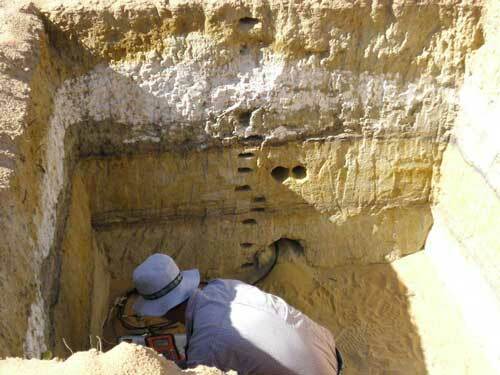 Pilot field work at Jubbah indicates the presence of appropriate material for radiocarbon dating, for example, charcoal and ostrich eggshells.